Camping in the Balkans is a really good accommodation option because of the plethora of amazing spots to enjoy the outdoors. On our road trip, we did a lot of wild camping, sleeping by beautiful beaches, lakes, rivers and the odd car park. But even though we had the basic essentials for cooking and washing in the van we also liked to treat ourselves to a night or two (or three if it was awesome) at a campground to have a proper shower and wash our clothes! Yea luxury! We stayed at few where we would have preferred to be wild camping in a car park but we won't mention them here. 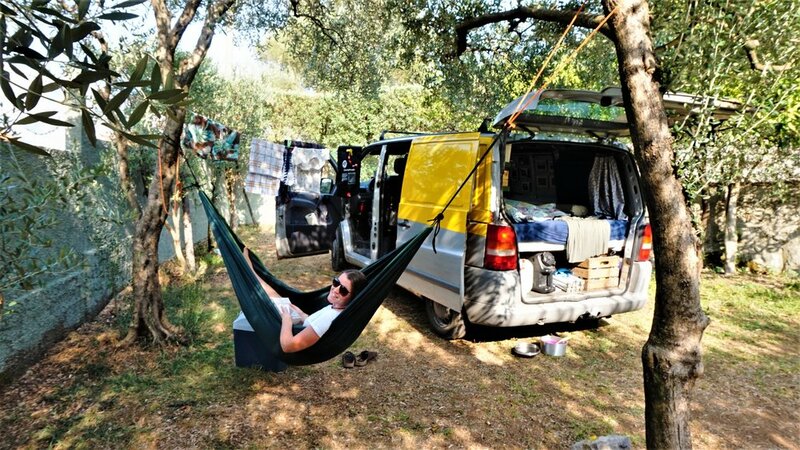 Because here we give you the gorgeous, comfortable and relaxed campgrounds of the Balkans. Ones that will have you booking extra nights and instagramming your new chill spot. At Camping Rino they take their slogan 'Feel Like Home' very seriously. From free coffee brought to your van every morning (even in the rain) to helpful advice, friendly smiles and a cosy camping environment you'll never want to leave. All that and they have a stunning location right on the banks of Lake Ohrid. There is a small areas for swimming in the lake but it was a bit chilly by the time we arrived at the end of the season. We were able to do plenty of sitting back and admiring the views with our morning coffee though! The food in the restaurant is really affordable and delicious. There are hot showers and reliable wifi that reached to the van - heaven! This place was such a great find! It was absolute luxury but on a backpackers budget. A really peaceful camping area with great toilet, shower, kitchen and hangout facilities. There is a great restaurant onsite but the crowning feature is the amazing pool! The perfect place to be on a hot Albanian day. We were there in September and it was still hot enough to swim every day. Camping Legjenda is named after the legend of Rofaza Castle which sits upon the hill looking over the campground. You can see the story depicted on the walls of the restaurant. There are also cabins and rooms if you want to ditch the van/tent for a couple of nights of luxury. Linda and her family are so friendly and will help you out with booking whatever you need if you're planning on heading to Theth or Komani. They also have great ideas for places to visit in Shkoder and nearby. If you'll be there for a few days (and trust us you'll want to be!) then check out our Shkoder City Guide. 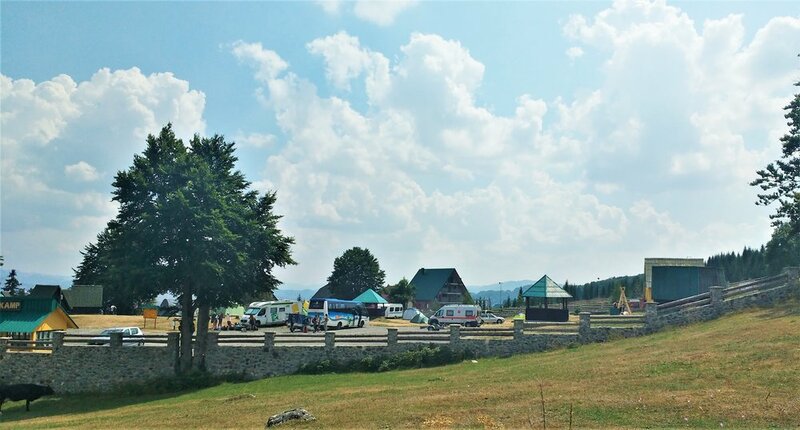 This campground is located just 12km from Mostar so is a great base if you want to explore the area but don't want to pay the hiked up tourist prices of the Mostar old town. It's set right on the river and there's plenty of nice seating to relax. The river is a chill 10°C so it's great for a quick dip on a hot day (it was 42°C when we were there!) But we couldn't stay in the water more than 30 seconds without going numb! Certainly refreshing though. They also have kayaks you can use for free. The family who run the campground are super friendly and you get a free welcome drink when you arrive. They also serve free fruit platters every morning and you can order other food and coffee. This was officially the most expensive campground of our trip. But we put this down to the generally more expensive prices of Slovenia and the fact that it was peak season. It was a small, well-run campground and was really well located for exploring. There are lots of great hikes in the area and the village of Vipava is super cute. We hiked up one of the mountains and over the other side to a great local restaurant for lunch, ask one of the staff to give you directions. Laundry: Machine available but I didn't note the price. We found this place by accident while searching for a wild camping spot. There were plenty of wild camping options around but we opted to 'splash out' on a shower and the hope of some wifi. Unfortunately (or fortunately) there is no wifi here. Just some cows and a few houses. There are some small cabins you can rent or camping is anywhere on the fields surrounding the house. The lake is around a 20 minute walk away and the owners will organise a tour to see the meanders of the Uvac river for €10 per person. This is meant to be beautiful but we got blessed with our first cloudy day so decided against it. This place is really isolated and peaceful and has beautiful views. This was the cheapest campground of our trip, just €7.20 per night! And right in the heart of the Durmitor National Park. Good toilet and shower facilities although the showers are solar powered so don't go too late or you'll be left with cold water! There are kitchen facilities, cabins for rent and some temperamental wifi. It's a great location for exploring the Black Lake and hiking the surrounding areas. We were there in August and it was really cold in the evenings so you'll need your warm layers! The Bay of Kotor is hugely popular and not nearly as cheap as the rest of Montenegro (check out our tips for visiting Kotor on a budget.) But this campground is in a really chilled little area of the bay, right around the other side from Kotor. There is a little beach and while the campground was full while we were there it still had a relaxed vibe. There is a river running next to the campground and the nicest spots are situated with river access. There are a good amount of showers and toilets which are clean and have hot water. Good wifi and some small shops nearby. This was quite out of the way but a great spot right on the lake. The lake was really dry when we were there but we did manage a quick dip and also hired a kayak from the campground to go out to see the monastery on the island. The campground is basic but has everything you need including a nice (but pricey) restaurant, good wifi and a warm shower. They also have rooms but at €50 a night this wasn't worth it for us. You can wild camp on the lake just before the campground so if you don't need a shower then this is a good option. The restaurant is open to everyone so you can get dinner and some internet instead of paying the €20 for the night. Laundry: Possibly on request but no facilities for public use. We also came across or researched a few other campgrounds along the way which were either full or we decided to wild camp nearby. This was right in the South of Albania and we used their bar and wifi while wild camping nearby. The campground looked small and relaxed. There is a really beautiful little beach nearby. I overheard the pricing as €10 per night for two people. This was full when we arrived at the lake so I suggest booking ahead in the peak season. But it looked like a really nice campground in a great location right on the lake. Beautiful views and peaceful surroundings. We made the mistake of staying a night at the campground further along the road (Camp Kranea) and would not recommend it. We then spent a couple of days wild camping on the beach. But this place looked really nice and the owner seemed very friendly. They had a restaurant and it is across the road from one of the nicest beaches we found in Albania. This one is located on a hill overlooking Sarajevo and seems like a great location to enjoy the city. It's small so gets booked up quickly in the summer. It also has a guesthouse with rooms. If you need more convincing to go to Bosnia and Herzegovina read some reasons to go. There are lots of other great campgrounds in the Balkans which don't have websites and aren't on google maps. So don't feel you need to have everywhere booked in advance. Just keep rolling and you'll stumble upon some great places to stay. And if not, find a spot to wild camp for the night and enjoy some beautiful nature with no one else around! We had a complimentary stay at some of the campgrounds mentioned above but all opinions and reviews are our own and we made sure to research and find places we would usually stay at. They were all as wonderful as we say!